Big respects take up a lot of space, cost more, and require more attention. Sometimes a little respect is all you want. Note: When trying to acquire a little respect, you can’t demand it. You have to earn it. Also, it’s always best to take your time to make sure the respect you get really suits you. Because once you get a little respect, you can’t return it (although you can lose it). So make sure whatever earned you a little respect is genuine. And once you have a little respect, take care of it. 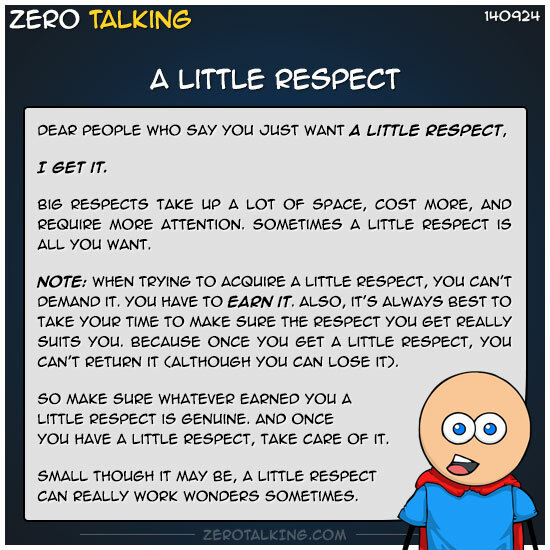 Small though it may be, a little respect can really work wonders sometimes.